Amber Labs is an essential part of our agency’s long-term aspirations to evolve from a service provider into an innovation partner. It is in equal parts a think tank, ideating on technology, design or business model improvement in the games space — but also a development team executing these concepts up to market release. Its mission is to help position Amber as a purveyor of commercially-viable blue ocean innovation, as well as to foster a culture of innovation among all teams it interacts with. The lab retains two major operational models: a black box innovation track based on a fixed budget, without management control or interference, which aims to deliver concepts, most often expressed as prototypes — and a directed innovation track, which receives demand from partners or internal stakeholders. The lab provides a range of support for the latter track, from low-touch ideation/planning/architecture facilitation, all the way to hands-on execution, depending on the requirements of the originating team. Amber’s approach to innovation consists of a four-step process. Its core is Ideation, a process comprising the first two phases of concept development (Sensing and Visioning), a method for generating original ideas, constantly refined through simultaneous small team iterations. The Sensing phase begins with a small group of three Amber employees, guided by a Creative Director, embarking on a wide exploration of a broad topic such as “stress”, “traffic” or “visually impaired people”. Group chemistry is crucial, since they must keep an open mind while searching for “weak signals” in an uncharted territory and challenge each other in the process. In the pursuit of defining a shared objective, every member of the team begins by stating his personal passions and motivations. Then, throughout the six sessions of this phase, they combine rational analysis of facts, figures, market trends, user behavior, emerging technologies and expert insights with intuitive and associative methods to arrive at a creative question. The question must be neither too vague as to point in no direction, nor so concrete that it responds itself. An example could be “How can we help visually impaired people engage in outdoor activities for free?”. During Visioning, the team initially generates lots of varied ideas using lateral thinking techniques such as analogies, random associations and reframes by answering the Creative Question. The harvested ideas are then filtered, improved and combined into concrete concepts. Afterwards, they are rated on likely impact and ease of implementation. The best one goes into a pitch that joins a line of ideas waiting the green light for prototyping. 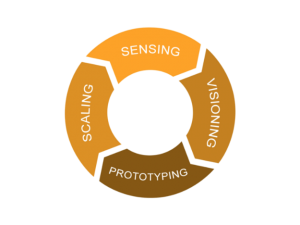 The following phase, Prototyping, may involve, besides Amber Labs core research engineers, additional Amber personnel, such as designers and graphic artists. Its purpose is to collect quick feedback on uncertain technical requirements or playtest user interaction and generate initially unforeseeable insights. The objective is continuous agile refinement of a prototype that can take a variable amount of time, depending on the project’s nature. If not terminated during these cycles, the concluded prototype along with the pitch and feedback collected during the entire process are submitted for the stakeholders’ evaluation confirming the opportunity of shipping it to Custom Engineering for full-scale production. Lastly, Scaling is a process largely undertaken outside of the innovation labs, which involves growth hacking the solution for large societal impact. The development teams operating the product the was developed in the preceding phases seek to identify the agents of emergent impact, generating forward momentum in adoption and aiming to secure a self-propelling movement around the product, by leveraging the intrinsic retention and virality of the product. Amber Labs allows our agency an excellent to research and innovate in all areas of interest to our talented engineers and creatives. A lot of their ideas are happening at the intersection of previously-distinct disciplines: combining Machine Learning with Rational Game Design to automatically generate levels in puzzle games, or filtering standard game metrics to learning algorithms in order to divine outcomes that inform the work of game designers. Quality Engineering proves to also be a fertile field for innovation, as games developed with popular game engines may lack the capabilities of automated UI testing. We expect that plenty of other opportunities to innovate will arise in every aspect of our business, as we continue our relentless pursuit of doing things better. We first introduced the innovation lab concept at the “Dev.Play” game dev conference in Bucharest, Romania in early September 2017 during a session titled 101 Concepts for Games Innovation.